Deku sticks, bottles, and whatever else you need, should fit nicely in this Legend of Zelda Packable Backpack. 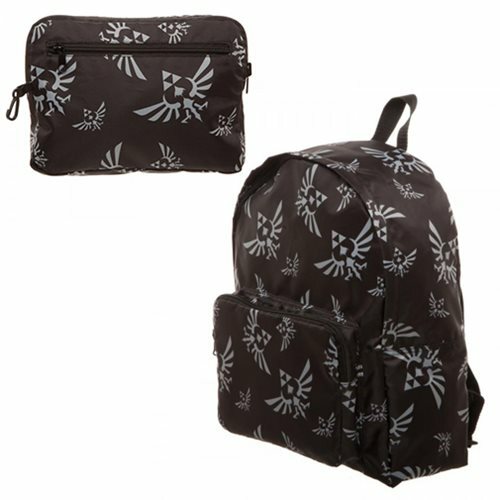 The Hylian Crest adorns the outside of the black bag. the packable design lets you fold it into a small pouch for easy storage when not in use. Bag packs into front pocket. The bag features 2-inch adjustable shoulder straps, and is made from a light-weight poly material. When opened the backpack measures approximately 12-inches wide x 15-inches tall x 5 1/2-inches long. When collapsed, the pouch measures about 9 1/2-inches wide x 7-inches tall. Ages 14 and up.